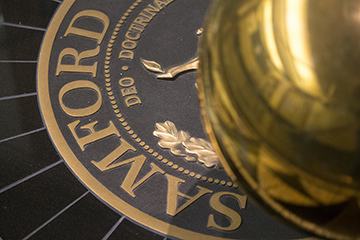 Samford University’s board of trustees approved an updated and expanded campus master plan, a new academic center and candidates for December graduation among several action items during its winter meeting Dec. 6. In what was described as their “most important action” of the meeting, trustees approved 302 candidates for December graduation, pending completion of degree requirements. Continuing their longstanding tradition, trustees paused to pray for the graduates. Trustees also approved a new Center for Excellence in Sports Analytics, the first university-level sports analytics center in the U.S. This interdisciplinary program will enhance research and other opportunities for faculty and students, according to Provost J. Michael Hardin. Trustees approved an updated campus master plan. This is the first major update of the university master plan since the campus moved to its current location in the 1950s. The dynamic conceptual plan features four primary phases that align with the university’s strategic plan and addresses needs in a long-term, fiscally appropriate and responsible way, according to Harry B. Brock III, Samford’s executive vice president and vice president for business and financial affairs. Trustees approved the appointment of one new faculty member for the Department of Physical Therapy in the School of Health Professions. Four trustees were attending their first meeting. Sue M. Belcher of Birmingham is a former teacher and part owner of Royal Automotive. Sherri Foyt, a Birmingham homemaker and former public school teacher, is a 1990 Samford graduate. Randy Gunter, a 1994 Samford graduate, is pastor of Meadowbrook Baptist Church, Rainbow City, Alabama. Rachel Corts Wachter of Spanish Fort, Alabama, is a 1990 Samford graduate, and a registered dietitian and diabetes educator. Trustees also reelected officers for a second one-year term, including chair Tim Vines, chief administrative officer with Blue Cross Blue Shield of Alabama in Birmingham; vice chair Beth Thorne Stukes, a community leader from Jasper, Alabama; secretary Victor E. Nichol Jr., a Birmingham banking executive; and assistant secretary Warren Bailey, a Birmingham businessman. Trustees approved 10 new members of the university’s 56-member board of overseers, a group of community, business and church leaders who advise the administration and are advocates for the university. Three trustees were recognized for completing their terms of service: Gerald Hallmark, retired pastor of First Baptist Church, Alexander City, Alabama; Mazen Sahawneh, a physician from Mobile, Alabama; and Albert Shumaker, an attorney from Centre, Alabama.